According to the Jewish Journal of Los Angeles, Adelson was chatting on Monday with a group at his Venetian Hotel in Las Vegas who were there for the annual “Tribe Fest,” a three days leadership training program of the Jewish Federations of North America. Adelson also took the opportunity to share with the group his thoughts on the remaining candidates in the Republican race. And what about his fellow member of the 1%, Mitt Romney? 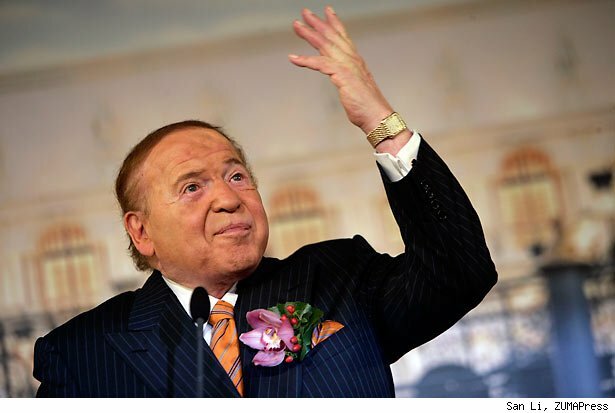 Adelson, who was sporting a button that read, “Obama – Oy Vey,” said that Romney is “not the bold decision maker that Newt Gingrich is.” In fact, Adelson predicted, that his horse in the race, the former House Speaker, would be the like Republican nominee for Vice President. Next Next post: The Next Pavarotti?